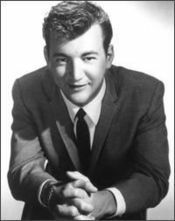 Bobby Darin (May 14, 1936 – December 20, 1973) (born Walden Robert Cassotto) was one of the most popular American, big band performers and rock and roll idols of the late 1950s. He is widely respected for being a multi-talented, versatile performer, who challenged and successfully mastered many music genres, including folk, country, pop, and jazz. Darin was also an accomplished, award-winning actor and a music-business entrepreneur. His wish for a legacy was "to be remembered as a great entertainer, and a human being." Among his many contributions, he was a "Goodwill Ambassador" for the American Heart Association because of his lifelong heart disease. One of the most versatile performers of his era, Darin could cause hordes of bobbysoxers to swoon while singing “Splish Splash” in 1958, then later bowl over their parents as the swaggering, Sinatra–sounding showman with performances of his mesmerizing rendition of Mack the Knife. Both songs became huge hits, with Splish Splash reaching number three and Mack the Knife staying at the top of popular music charts for nine weeks. The range of Darin's talents was as impressive as his unrelenting self-confidence and personal ambitions. Overcoming poverty, poor health, and a broken family, he rose to the heights of the entertainment profession. He remained a popular headline performer in Las Vegas and continued to pour his energy into entertaining an appreciative public until his death from heart disease at 37 years old. Darin was born to a poor, working-class Italian-American family in The Bronx, New York. His father disappeared a few months before he was born, at the height of the Great Depression. He once remarked that "my crib was a cardboard box, later a dresser drawer." As a result, his mother had to accept public assistance to take care of her infant son. It was not until he was an adult that he learned that the woman he thought to be his sister Nina, 17 years his senior, was in fact his mother, and the woman he thought to be his mother was in fact his grandmother. The identity of his father was never publicly or privately disclosed. His mother refused to reveal that information even to him. Darin went to his death without knowing the identity of his birth father. Frail as an infant, perhaps from the poverty, resulting in a lack of proper diet and medical attention; at the age of eight Darin was stricken with multiple bouts of rheumatic fever. The illness left him with a seriously diseased heart, and he lived with the constant knowledge that his life might be a short one: As a child he had overheard a doctor tell his mother he would be lucky to reach the age of 16. Driven by his poverty and illness, and with an innate talent for music, by the time he was a teenager, he could play several instruments, including piano, drums, and guitar. He later added harmonica and xylophone to the list. An outstanding student, with a genius-level IQ, Darin graduated from the Bronx High School of Science and then attended Hunter College on a scholarship. Wanting a career in the New York theater, he left college to play small nightclubs around the city with a musical combo. In the resort area of the Catskill Mountains, he was both a bus boy and an entertainer. As was common with ethnic minorities at the time, he changed his Italian name to one that sounded more "American." He reportedly chose the name "Bobby" because he had been called Bobby as a child (some called him "Waldo," a version of his first name). He picked the last name "Darin" because he had seen a malfunctioning sign at a Chinese restaurant reading "DARIN DUCK," rather than the intended "MANDARIN DUCK," and thought the "Darin" looked good. Later this story was modified, as he said on one occasion that the name was randomly picked out of the telephone book. Neither story has been verified. In 1956, Darin's agent negotiated a contract for him with Decca Records, where Bill Haley & His Comets had risen to fame. However, this was a time when rock and roll was still in its infancy, and the number of capable record producers and arrangers in the field was extremely limited. Like other performers, Darin was at first pigeon-holed, recording the banal songs popular with record executives at the time. He left Decca to sign with ATCO Records, where he wrote and arranged music for himself and others. There, after three mediocre recordings, his career took off in 1958 when he co-wrote and recorded his unique party song "Splish Splash." It became an instant hit, selling more than a million copies. The song written with DJ Murray the K, who bet that Darin could not write a song that started out with the words, "Splish Splash, I was takin' a bath," as suggested by Murray's mother; they eventually shared writing credits with her. This was followed by more hits recorded in the same successful style. In 1959, Bobby Darin recorded "Dream Lover," a ballad that became a multi-million seller. With financial success came the ability to demand more creative control, despite the objections of many people around him. His next record, Mack the Knife, was the classic standard from Kurt Weill's Threepenny Opera. Darin gave the tune a vamping jazz-pop interpretation. The song went to number one on the charts, sold several million copies and won the Grammy Award for Record of the Year in 1960. Darin was also voted the Best New Artist that year. "Mack The Knife" has since been honored with a Grammy Hall of Fame Award. Darin followed "Mack The Knife" with "Beyond the Sea," a jazzy English-language version of Charles Trenet's French hit song "La Mer," which became another big hit for him. During this time he became one of the hottest nightclub performers around, propelled by the success of "Mack the Knife" and "Beyond the Sea." He set all-time attendance records at the famed Copacabana nightclub in New York City, where it was not unusual for fans to line up all the way around the block to get tickets. The Copa sold so many seats to Bobby's shows there that they had to fill the dance floor with extra seating. Darin also headlined at the major casinos in Las Vegas, the youngest performer to do so. He was also instrumental in bringing up new talent. Richard Pryor, Flip Wilson, and Wayne Newton opened for his night club performances when they were virtually unknown. Early on, at the Copacabana, he insisted that black comic Nipsey Russell be his opening act. This was a very hard sell in the era of nightclub segregation, but because Darin had set attendance records even eclipsing Frank Sinatra, his request was grudgingly granted. In the 1960s, Darin also owned and operated a highly successful music-publishing and production company, TM Music, which was responsible for many hit records including "Under The Boardwalk" and "Good Lovin." He signed Wayne Newton to TM, giving him a song that was originally sent to Darin to record; and that record went on to become Newton's breakout hit "Danke Schoen." He was a mentor to Roger McGuinn, who worked for Darin at TM Music before going off to form The Byrds. Darin also produced Rosey Grier's 1964 LP Soul City, as well as Made in the Shade for Jimmy Boyd. In addition to music, Darin turned his attention to motion pictures. In 1960, he was the only actor ever to be contractually signed to five major Hollywood studios. He wrote music for several films and acted in them as well. In his first major film, the youth-oriented romantic comedy, Come September, he co-starred with 18 year old actress Sandra Dee. They fell in love and were married in 1960. They had one son, Dodd Mitchell Darin, in 1961. They were divorced in 1967. Asking to be taken seriously as an actor, Darin took on more meaningful movie roles, and in 1962, he won the Golden Globe Award for "Most Promising Male Newcomer," for his role in Pressure Point. In 1963, he was nominated for an Academy Award for Best Supporting Actor for his role as a shell-shocked soldier in Captain Newman, M.D. At the Cannes Film Festival in France, where his records—in particular "Beyond the Sea"—brought him a wide following, he won the French Film Critics Award for Best Actor. A major disappointment in his acting career came when he lost the lead role of "Tony" in West Side Story to Richard Beymer. Several leading Hollywood men, such as Anthony Perkins, Warren Beatty, and Elvis Presley, were also major contenders for the role. Another lost opportunity came when Darin had also been penciled in to star opposite Jackie Gleason in The Hustler before first choice Paul Newman's schedule suddenly allowed him to step in. Darin's musical output shifted toward the folk-rock genre as the 1960s went on, and he became more politically aware and active. In 1966, he had another big hit record, but this time it was with folksinger Tim Hardin's romantic folk-influenced song, "If I Were a Carpenter." Darin also worked on the 1968 Presidential election campaign of Robert Kennedy and was profoundly affected by Kennedy's assassination, retiring from public performances for more than a year. Coming back, in 1969, he started another record company, Direction Records, putting out folk and protest music. He said of his first Direction album, "The purpose of Direction Records is to seek out statement-makers. The album is solely comprised of compositions designed to reflect my thoughts on the turbulent aspects of modern society." Darin put out several 45s and LPs on Direction billing himself as name "Bob Darin." He grew a mustache and stopped wearing a hairpiece. Within two years, however, all of these changes were dropped. At the beginning of the 1970s, Darin continued to act and to record, including several albums with Motown Records. In January 1971, he underwent his first surgery in an attempt to correct some of the heart damage he had lived with since childhood. Darin married Andrea Yeager in June of 1973. She was not from show business, and he felt that she brought him down to Earth and loved him for who he was, not for his image. In 1972, he starred in his own television-variety show, on NBC, The Bobby Darin Amusement Company, which ran for two years. He made TV guest appearances and remained a top draw at Las Vegas. However, due to his poor health he was often administered oxygen after his performances. In 1973, Darin's ill health took a fatal turn when his mechanical heart valve clotted. He had decided to stop taking his anticoagulant drug, warfarin, which he was supposed to do on a daily basis. Darin reportedly also neglected to take antibiotics as a precaution before undergoing dental work. As a result, bacteria seeped into his bloodstream and further weakened his already fragile heart. He died on December 20, 1973, following surgery to repair his heart valve. In accordance with his wishes, his body was donated to the UCLA Medical Center for research purposes. Shortly before his death Darin divorced Andrea. Some of those close to him have claimed, not entirely credibly, that this was an attempt to distance her from the pain of his death. He did talk to Sandra Dee a short while before his death, but the call was mainly to talk to his son, Dodd. Contrary to the 2004 motion picture of Darin's life, Beyond the Sea, Dee was not by his side when he died, nor had she visited him during his final hospital stay, at Darin's request. In 1990, fellow rock pioneer Paul Anka made the speech at Darin's induction into the Rock and Roll Hall of Fame. In 1999, he was voted into the Songwriters Hall of Fame. In 2000, actor Kevin Spacey, a lifelong fan of Darin, acquired the film rights to his story. Spacey directed and produced the film, played the starring role, and co-wrote the script. The film is named after Darin's international hit, Beyond The Sea. With the consent of the Darin estate, the movie was released at the 2004 Toronto International Film Festival. In spite of its high production values, strong studio promotion, and critical acclaim, box office results were disappointing. However, the movie spurred a renewed interest in Darin, which has resulted in the release of "never before heard, or seen" material. On May 14, 2007, Darin was awarded a star on the Las Vegas Walk of Stars. The tribute recognized Darin for his contribution to making Las Vegas the a world entertainment capital and for being one of the greatest entertainers of the twentieth century. Darin also has a Star on the Hollywood Walk of Fame. IMDB Database of Movies. www.imdb.com. "Beyond the Sea" (2004) Hollywood movie on the life of Bobby Darin. www.imdb.com. This page was last modified on 17 December 2016, at 22:23.